The below entry was taken from Vyvanse’s company website. I have been receiving a lot of questions regarding Vyvanse and thought the below info could be helpful. 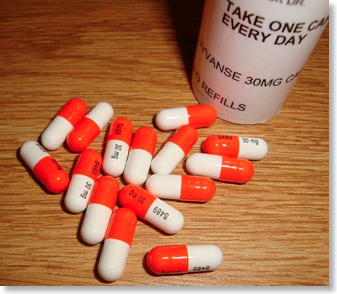 Vyvanse is a federally controlled substance (CII) because it can be abused or lead to dependence. Keep in safe place to prevent misuse and abuse. Selling or giving away Vyvanse may harm others, and is illegal. Vyvanse is a stimulant. Misuse of stimulants may cause sudden death and serious heart problems. •	Vyvanse is a stimulant medicine. The following have been reported with use of stimulant medicines. Heart-related problems: sudden death in patients who have heart problems or heart defects stroke and heart attack in adults increased blood pressure and heart rate Tell your doctor if you or your child have any heart problems, heart defects, high blood pressure, or a family history of these problems. Call your doctor right away if you or your child have any signs of heart problems such as chest pain, shortness of breath, or fainting while taking Vyvanse. Mental (Psychiatric) problems: All Patients new or worse behavior and thought problems new or worse bipolar illness new or worse aggressive behavior or hostility Children and Teenagers new psychotic symptoms (such as hearing voices, believing things that are not true, are suspicious) or new manic symptoms Tell your doctor about any mental problems you or your child have, or about a family history of suicide, bipolar illness, or depression. Call your doctor right away if you or your child have any new or worsening mental symptoms or problems while taking Vyvanse, especially seeing or hearing things that are not real, believing things that are not real, or are suspicious. ◦	motion and verbal tics. Patients with tics or Tourette's syndrome may experience a worsening of symptoms while taking Vyvanse. ◦	slowing of growth. Your child should have his or her height and weight checked often while taking Vyvanse. The doctor may stop treatment if a problem is found during these check-ups. This is not a complete summary of safety information. For additional safety information, please click here for Full Prescribing Information and Medication Guide, including Warning about Potential for Abuse, and discuss with your doctor.